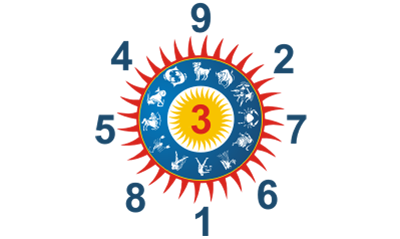 This number brings tendency towards spirituality, compassion towards others and optimism. These people are happy by nature and have the ability to let go of grudges easily. Being overly idealistic may pose a problem, and their practical lives should be balanced with attention to business matters and development of entrepreneurship. Number Three people should be more sincere and responsible. Those with Number Three can make others comfortable in conversations and social situations, and people appreciate them for this. They are good at organizing their own life, but do not force the same onto others. Those with Number Three will benefit from rigorously organizing their daily life, as this will allow more of their genuine creativity to flourish. Their home should be kept spotless as chaos in that area is a source of stress. It is important for those with Number Three to renew themselves by spending some time in nature on a regular basis. Those with Number Three have great capacity to be beneficial to others and should never be wasteful. They aspire towards being ethical in their dealings and carefully weigh what others say. The purpose of Number Three people is to inspire others. Their natural wit can lighten many situations, and their gift of words should always be used in a positive way. Their genuine optimism can help draw many towards light.